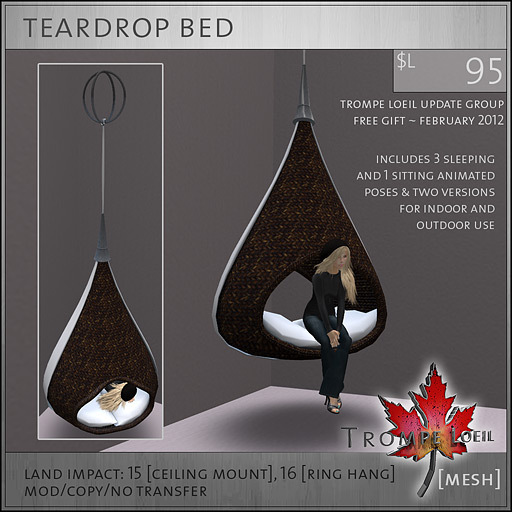 We have an adorable mesh group gift going out free to Trompe Loeil Update Group members today – a wicker Teardrop Bed with four animated poses (three sleeping and one sitting – its also a chair!) and two versions for easy indoor and outdoor use! Plus its made specifically to be easy mod/copy, so feel free to tint the pillows, adjust the shadow underneath, increase the ring mount size – its up to you! Non-group members can pick this up or give as a gift for a super low price of $L95 – either inworld at any of our Trompe Loeil locations, or online at the Marketplace. Or join the Trompe Loeil Update Group and get this great gift for free! Just click the sign (no group slot required) at any Trompe Loeil location. Also, Trompe Loeil is getting ready to appear at two huge upcoming shopping events with a charity bent: Culture Shock (benefiting Doctors Without Borders, my favorite charitable organization) on May 5th and SL’s Home & Garden Expo (benefiting RFL) on May 19th – appearing on a special dedicated mesh region with some truly amazing mesh creators, and we’re so thrilled!